This has truly been an exhausting week and I’m glad that in less than 24 hours it will officially be the weekend!!! Hubby is doing well and should be home from the hospital early next week. In the meantime I am enjoying the little break, I only have to make my side of the bed and the bathroom is all mine – lol! 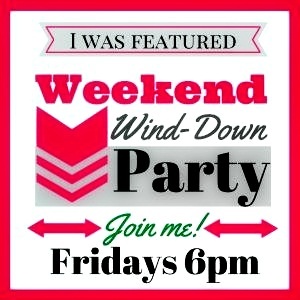 Welcome to the Weekend Wind-Down Party #12, where food, fun and fashion is shared by some wonderful bloggers and this week’s features are just a few examples. Congratulations and thank you to this week’s featured bloggers! Please feel free to add this button to your Blog and check our Pinterest Page as you will also be featured there. The rules have remained the same and we ask that you follow each of your hosts on at least one Social Media websites. I look forward to reading your posts this weekend while visiting hubby in the hospital and watching him sleep! Have a wonderful weekend, be safe and stay blessed! Another great party, thank you for featuring my Cinnamon Crunch Cookies. I’ve been waiting in anticipation to see them in the party. Thank you – hope you’ll keep coming back and sharing your great recipes! Another Fantastic Party. Love seeing all these ideas. My goodness people are creative. Aren’t they! I love hosting these parties just for the ideas alone! Have a wonderful weekend. I got goosebumps reading your last post/update about your husband’s surgery. Glad he is doing well, and will continue to send you thoughts, vibes, and prayers! Thanks for hosting in the midst of all the chaos! Thank you, yes, life is so precious and can change in the blink of an eye. I am trying to keep my mind occupied until he’s home. Have a wonderful weekend! I know you were glad for this week to end! Hope you can recover this weekend. Also, thanks so much for featuring my post. You are welcome, yes, will definitely sleep in on Sunday. Tomorrow will spend the day at the hospital. Have a wonderful weekend. Thanks for featuring our road trip survival tips! We appreciate it, Antionette! You are welcome, thanks for sharing. Have a wonderful weekend. Thank you, yes gotta put a little fun into the situation. Have a wonderful weekend! I’m so glad to hear that your hubby’s doing well and will be returning home soon! I’ve been busy and only started to catch up with what’s happening with my bloggy friends. I would love to participate in this link-up and hopefully I have something ready on your 13th linky on Friday! Take your time, life happens. Happy April Fool’s Day!